This package includes 1- 13oz can of Cafe' Du Monde Decaf Coffee and Chicory and 1- 28oz box of Cafe' Du Monde Beignet Mix. 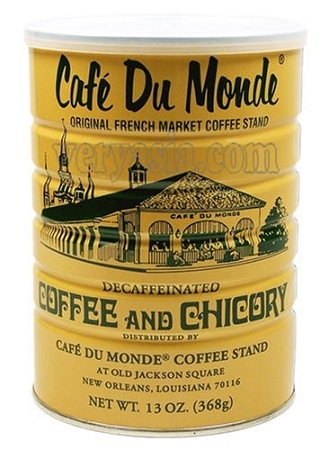 Cafe' Du Monde Decaffeinated Coffee and Chicory comes with an easy open coffee can and lid. This is the same great decaf coffee sold at Cafe' Du Monde Coffee Stands in New Orleans. Cafe' Du Monde uses an Ethyl Acetate process to decaffeinate their coffee. Ethyl Acetate is a natural chemical found in many fruits. This Decaf coffee has a rich and bold New Orleans Style flavor. One box of Cafe' Du Monde Famous Beignet Mix makes 4 Dozen French Beignets. This is the same mix used in the Cafe' Du Monde Coffee Stands in New Orleans. Great for breakfast or dessert and goes well with a fresh cup of Cafe' Du Monde's Decaf coffee. Cafe' Du Monde Decaf Coffee & Chicory, 13 oz.